I just have to show you the completed Orca Bay quilt on the bed. Of course it still has to be quilted. 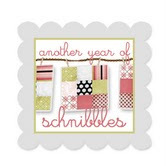 But that will come later.This shows the border which I really like. As you see I have joined in with the Friday Night Sew In. Kim talked me into it. So if you want to join in go to Hand Made by Heidi to sign up Starts on the 17th. 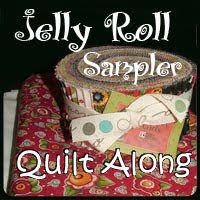 This is my Schnibble which is this months little quilt to make. for the Pink Cushion quilt show the last day of the month. This needs to be sewn together and the picture is sideways. Well the last picture left so that will come later. See you at the sew in. Thanks for stopping by. Your orca bay is just so pretty! Love that you are using your husband's shirts, your quilt will be full of love. Your Orca Bay is gorgeous. Mine is at the same stage, but I hope to quilt it soon. I still have my Christmas quilt on the bed as I intended to have the new one quilted sooner and decided to leave it on the bed until the new one is done, lol. The quilt from your husbands shirts is absolutely awesome. It reminds me of the little kaleidoscopes we looked through as kids only prettier. It would be on my to do list, only I don't like doing string blocks very much.